In the below video Mike Jones Sensei of NY Aikikai Dojo provides instruction on one of the basic forms of kaiten nage from a same side grab (katatedori). 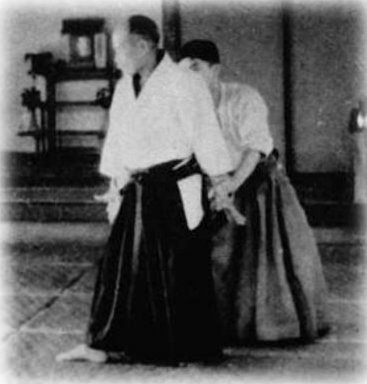 Morihiro Saito Sensei (8th Dan) demonstrates various traditional forms of Katatedori kaiten nage as practised by the Founder of Aikido in the immediate post war period. In the below videos Christian Tissier Sensei (8th Dan Aiki Kai) provides instruction and technical points for 2 of the commonly practised forms of Katatedori kaiten nage. 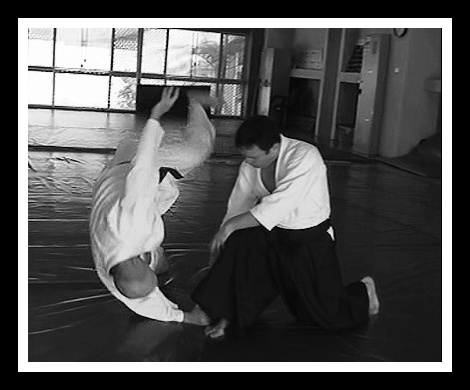 In the below video, Ian Grant and Jeremy Gehrke Sensei of Aikido Warrior Fudoshin Dojo (Brisbane) demonstrate an alternate form of Katatedori kaiten nage inspired by O’sensei’s 1934 technical manual “Budo Renshu“. A couple of weeks back, I was talking after class with a relative newcomer to our Art who had been pondering on a number of philosophical issues relevant to the martial practise of Aikido. The discussion went along the lines that if Aikido is not about teaching people how to fight, then what is it really about. There is probably no right or wrong answer to this question. Speaking from a strictly martial context, my own view is that Aikido is about giving the practitioner skills to allow them the choice between a forgiving response and a destructive response to an attack. I think it would be fair to say that in most violent altercations the respondent to an attack ordinarily only has the option of a destructive response. This response involves either applying a destructive force to repel the attacker or accepting self destruction through submission. What Aikido facilitates is giving the recipient of an attack another option. In Aikido we learn to merge an attacker’s energy (or ki) with our own energy such that the attacker’s centre of balance is taken while our centre remains strong. The result is that for a moment of time the attacker is completely vulnerable. It is at this point that the Aikido practitioner is in a position to make a choice between one of 2 options. The first option is a forgiving response where damage to the attacker is minimalized to that necessary to end the attack (i.e. 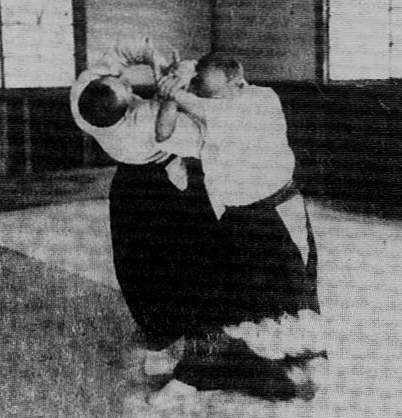 through the application of an Aikido technique). The second option is to take advantage of the attacker’s weakened structural position and execute maximum damage to the attacker, such as a strike to a vital organ. In Aikido we obviously advocate the first choice. 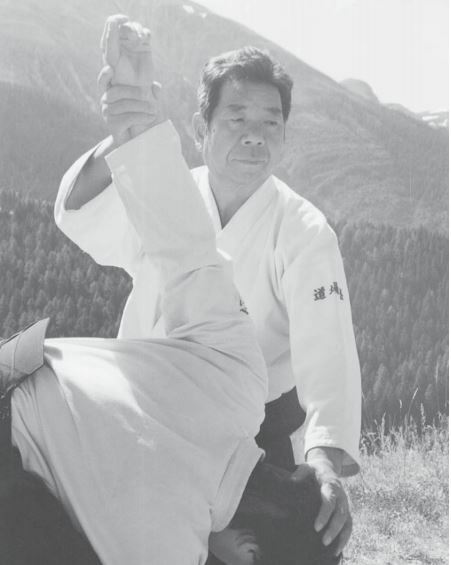 Taken from this perspective, Aikido is not about learning skills to destroy an attacker, but rather learning skills to have the option of a more forgiving response. (c) Aikido: Christan TISSIER in Budapest 2013 (teaching) at http://www.youtube.com/watch?feature=player_detailpage&v=9PQv5aR_hsg (particularly at about 11.07 mark) – Christian Tissier Sensei comments on the destruction/forgiveness choice in Aikido applications. 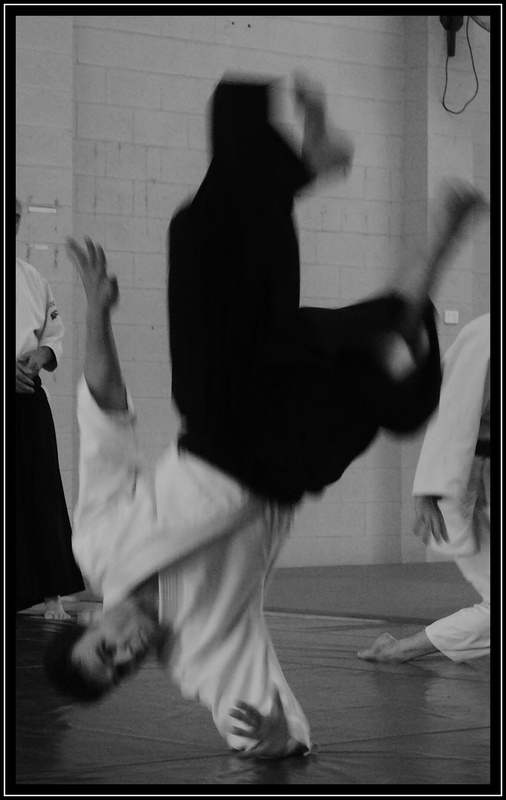 Aikido – I do all my own stunts! I recently watched an interview with wrestler Hulk Hogan where he said that in professional wrestling the ending is predetermined but the “bumps are real”. It crossed my mind that this is the same situation in Aikido. When we practise kata or tanininzugake the agreement is usually that at the end the nage will still be standing and the uke will one way or another be knocked to the ground. As in professional wrestling, the pre-arranged understanding between the nage and uke does not change the fact that for the uke the final meeting with the mat is going to be very real. The message we should probably all keep in mind is that at the end of the day we owe it to ourselves to stay safe. Below are some personal views on ways to keep in one-piece. Some people will be immediately appalled that I would suggest that tanking (i.e. just falling down) is ever an acceptable strategy. However, in a modern Aikido world where newcomers can be on the receiving end of techniques within 20 minutes of starting their first lesson, tanking is probably the only safe option available for them. Predictive ukemi occurs where the uke essentially predicts to varying degrees what the nage is about to do and moves themselves into a position to best take ukemi from it with minimum possibility of injury. the uke is seeking to experiment or simply develop their ukemi skills when receiving specific techniques. The below short video is an example where predictive ukemi is used to protect the uke from getting a good belt to the face (and potential trip to the dentist) from an atemi based technique. I use the term non-predictive ukemi to refer to those situations where the uke strikes or attacks with no regard to the likely technique or action to be taken by the nage. The form of ukemi ultimately employed by the uke at the conclusion of the technique is accordingly unknown until the last moment. While this is a highly worthwhile and quite exhilarating form of training, it requires a strong trust between the nage and uke, including an understanding that the nage will at all times have the highest regard for the uke’s safety when executing their techniques. Particularly important is that the nage appreciates and adapts the intensity of their techniques to correlate with the uke’s experience level and falling skills. This is my favourite form of ukemi. While still non-resistant in nature, the essence of this ukemi is that when the uke feels their centre is being taken, the uke reacts by blending with nage’s actions and attempts to regain their balance. A sensitive nage will immediately adjust the application of the technique to compensate. The typical end result is Aikido being dynamically practised with power and grace. Many of the Aikido demonstrations by Christian Tissier Sensei (7th Dan) are examples of this type of practice at its highest level – see for example Tissier Bercy 2005 HD (at o:59 to 1:39). However, I would only recommend engaging in this method of uke arts (particularly in taninzugake) if your ukemi skills are well-developed and have become second nature. My own experience is that the speed in which you come out of the technique seems to significantly increase with this type of training. In addition, I sometimes find the gracefulness can be dangerously deceptive and the final powerful meeting with the mat can be quite a mental shock. At the end of the day, we in Aikido do our own stunts and no one stands in for us when we fall from an applied technique. To stay safe, the most important thing for us is to use common sense and practise at a level commensurate with our ability to walk away safely in the most likely event that we meet the mat. Posted in All posts, Training - Falling and ukemi arts and tagged Aikido, Aikido training, Aikido Warrior, Atemi, Christian Tissier Sensei, Hulk Hogan, Ian Grant, No touch techniques, Safe aikido practice, ukemi, Video/Photo Albums on January 29, 2013 by Aikidowarrior.